When you live on a stipend, frugality is a way of life. You know you can’t live a freewheeling lifestyle on your grad student income, at least not without racking up massive debt. But the approach you take to frugality has an enormous effect on how restrictive you perceive your lifestyle to be and how much time you spend on spending less. When you have a dissertation to write, you don’t want to be spending hours each week scrimping and saving. Effective frugality for a grad student has to be automatic. The best kind of frugality minimizes spending on what’s least important to you so that you can divert your money to what’s most important to you – without you compromising the time you’re suppose to devote to your studies. And practicing frugality doesn’t mean that you will feel deprived or be living paycheck-to-paycheck. 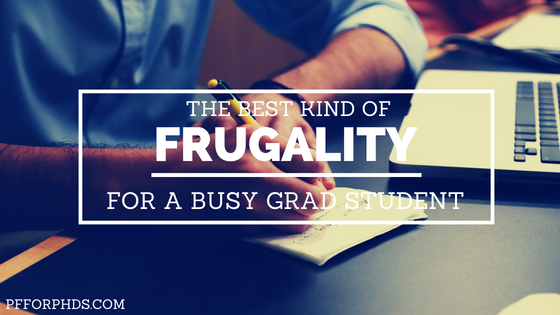 You can use frugality to give yourself a leg up on wealth creation, even during grad school. What is the best kind of frugality? First, we recognize that the best kind of frugality is unique to each individual. Frugality is not a one-size-fits-all solution. Yes, there are popular approaches and strategies, but you still get to pick and choose which practices you will adopt. If spending money in a certain category enables you to live your values – and cutting back in that area would impede that – keep spending there. Move your search on to another category for potential cuts. Of course, the reality of living on a stipend may force you to revisit your valued category, but it should be last on the list for cutbacks. Second, the best, most effective frugality preferentially targets your largest expenses. Third, once you do the work to reduce those expenses one time, your frugality keeps the expenses low in perpetuity, either because they are fixed expenses or because the frugal practice has become habit (ideally, an effortless habit). Think of frugality as an 80/20 problem. You can get 80% of your total reduction in spending from 20% of your expenses, if those expenses are the largest ones in your budget. You can eliminate 10 small expenses that won’t add up to as much as one partial cut to a large expense. When you’re searching for places to cut back in your spending, start at the top. Using your budget, any past spending data you have, or your memory, rank your expense categories from largest to smallest. Your largest categories likely include rent/mortgage, transportation, and groceries, and other possibilities are eating out/alcohol, entertainment, travel, utilities, childcare, and shopping. Once you have your ranked list, process each spending category from largest to smallest, brainstorming ways you could reduce your spending in that area. Use resources like our Frugal Practices or frugality websites to target each spending category. Seriously evaluate if you can implement one of your ideas in each category. Sometimes the prospect of reducing your spending on a very large expense is quite daunting. You may have contracts in place that limit your ability to change the expense for up to a year. Often, reducing a large expense will take quite a bit of work. People tend to be very psychologically resistant to change as well. But you have to focus on how much your quality of life can be improved in other areas by taking those steps. There may be quite a delay from the day that you decide to reduce your spending on a large expense to the day that you accomplish it. Deciding to reduce this kind of expense isn’t as immediately rewarding as implementing a frugal strategy that you can benefit from immediately. But don’t let that deter you from planning and following through on your idea. While you wait out the contract or research the decision, keep track every month of how much money will be freed up by the change and imagine what you could be doing with it. The best kind of frugality happens in the background of your life without you having to pay any attention to it whatsoever. When you reduce a large fixed expense, you practice that frugality without even noticing it. (The corollary is that fixed spending is easy to let inflate, as well, since it’s not an active decision.) If it was difficult to reduce that expense in the first place, like getting out of a contract, it’s pretty difficult to reverse the measure, too. This is unlike any strategy that takes willpower or time to enact. In a tough or busy moment, you could easily forgo that strategy and return to your higher-spending ways. Reducing a fixed expense locks in that lower rate, at least for a period. Some of your larger expense that are ripe for reduction are variable expenses, so you lose the benefit of locking in the lower rate like with a fixed expense, but they are still worth pursuing when you’re looking to reduce your spending. The key to reducing a variable expense is to make your frugal strategy a habit. After establishing the strategy, you should automatically follow it unconsciously and without having to use willpower. Until you reach that point, you should use whatever prompting strategies work for you to remind you to follow the strategy. It won’t feel natural at first, but keep at it. However, if you continue to chafe against the habit after weeks or months of trying it out, it’s probably not for you. Don’t use your limited time and energy forcing a frugal strategy that refuses to become a habit or takes up too much time or energy. The best traits to cultivate with respect to your frugality are creativity and daring. Especially with respect to your variable expenses, ask yourself what you really have to lose by trying something new. If possible, give each frugal strategy a one-month trial. That should be enough time to get over your resistance to change, evaluate the strategy, and possibly create a new habit. If it doesn’t work out – and if you get really creative, not everything will – you can go back to your old ways. Of course, if a strategy requires becoming locked in or an up-front cost, do you research before leaping. A PhD is a long haul in grad school. If you adopt the attitude toward frugality outlined above, think how many different frugal strategies you can try out over the years. Even if you only made habits of 20% of them, that could impact your spending enormously. One of the great benefits of living on a stipend is figuring out what is important for you to spend on and what isn’t. If you maintain the comfortable but low lifestyle you fine-tune in grad school after you start earning more from your real jobs – probably with a few judicious upgrades! – you can start making huge strides in increasing your net worth. What fixed expenses have you reduced during grad school? What frugal strategy did you try out that eventually became a habit?